Sarah Virginia Wade, popularly known as Ginny, was only the third British player since Dorothy Round, in the 1930s, to win three women’s singles Grand Slam tournaments. 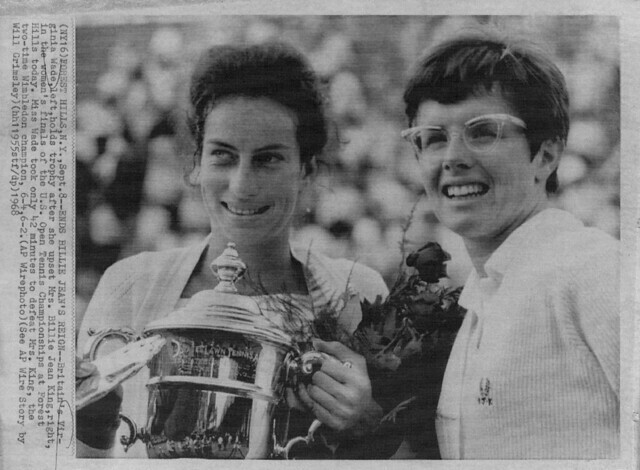 The other two were Angela Mortimer and Ann Jones, who both won on the extremes of court surfaces, grass and clay, whereas Wade’s Grand Slam titles were all on grass. Intensely patriotic, she represented her country for an unparalleled span of years: and her crowning achievement was to win Wimbledon in 1977 when the 100th championships coincided with the 25th anniversary of Queen Elisabeth II’s accession to the throne. The Queen was present for the occasion. Wade’s patriotism had been diverted from South Africa. Her mother was born there, of British parents, and graduated from Rhodes University before moving on to Cambridge, where Wade’s father, an Oxford graduate, was chaplain. The youngest of four children, Wade was 11 months old when the family settled in Durban, where the archdeacon’s daughter turned out to be a bundle of inexhaustible energy, became obsessed with tennis, and gradually developed a tempestuous, slam-bang playing style. 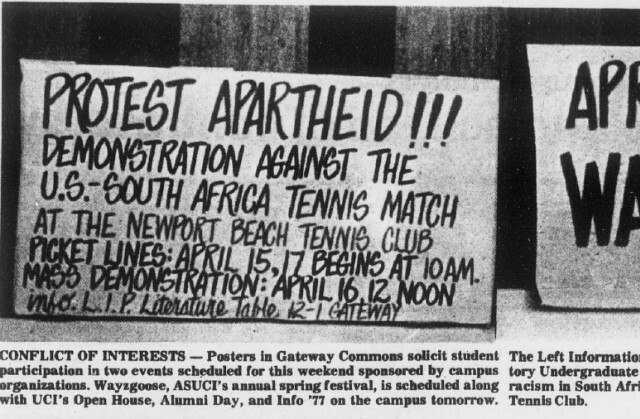 She was 15 years old and one of the nation’s most promising juniors when – South Africa having become a Republic outside the Commonwealth – the Wades returned to England, in February, 1961. At first they lived at Wimbledon, where Wade went to the local grammar school and, with her sister, joined the club across the road from the All England Club. She saw her first Wimbledon that year (Angela Mortimer beat Christine Truman in the first all-British final since 1914). It was in 1961, too, that the family moved to Kent and, this time, stayed put. All one needs to add to that potted off-court history is that Wade, the daughter of a clergyman and a mathematics teacher, studied at the University of Sussex and graduated in general science and physics in June, 1966 – her examinations coinciding with the more energetic challenges of a Wightman Cup contest at Wimbledon. That background was important. As a much travelled teenager from a scholarly, intellectual, upper middle-class environment rooted in the vicarages of two nations, Wade was a rare commodity. Thee were plenty of players around who could list one or two similar items in their curriculum vitae, but none who combined so much that was unusual. 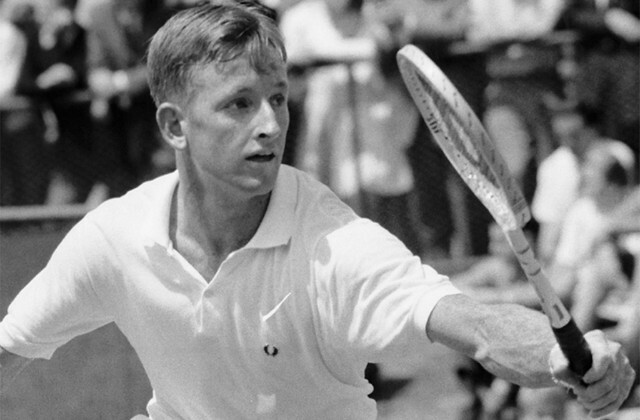 Wade was a throwback to the kind of players who had graced Wimbledon half a century earlier. Inevitably she was something of a misfit in the context of the international tennis circuit as we knew it in the 1960s and 1970s. With her slightly haughty manner, her up-market accent, and her coterie of social and cultural peers, she dod not find it easy to mix with the street-smart hoi polloi. It was as much to her credit as theirs that, while remaining a mite eccentric, she eventually became part of the family. It might have happened sooner but for her comparatively cloistered upbringing. All that goes some way towards explaining why, in her early years on the tour, Wade lacked a winning personality. It also partly explains why she found it difficult to keep a rein on a passionate nature that often erupted into querulous and unseemly on-court tantrums. She was agressive, turbulent, volatile, highly strung. Often, she was so nervous or distraught that her stroking technique and tactical sense were adversely affected. On such occasions she could lose to inferior players: as happened, notably, when Christina Sandberg, Pat Walkden, and Ceci Martinez beat her in the Wimbledons of 1968, 1979 and 1970. It sat oddly with Wade’s social and academic development that, at times, she could be capable of ill-tempered outbursts and tactical naïvety. She could not always control the fires burning within her – but they never went out. Wade always had star quality or, as friend once put it, a ‘divine spark’. She enjoyed going on stage at players’ cabarets. She saw herself, I suspect, as part of the ‘Establishment’ class born to exert authority. And as the years went by she mellowed, achieved emotional maturity, played with smiling self-assurance, and ceased to get rattled. She learned to control her temperament, her game, and her opponents. Even the ‘phase one’ Wade was capable of great performances: spectacular, exciting, dramatic, but eschewing the infuriating wildness that punctuated those early years. The demons within were tamed on special occasions in 1968, 1971 and 1972. Her success in the first Open tournament, at Bournemouth (her birthplace), had no moe than historic signifiance, because the women’s event was a sideshow to the men’s. But in the first US Open championships in 1968 she was devastating, beating such formidable opponents as Rosie Casals, Judy Tegart, Ann Jones and Billie Jean King without conceding a set. 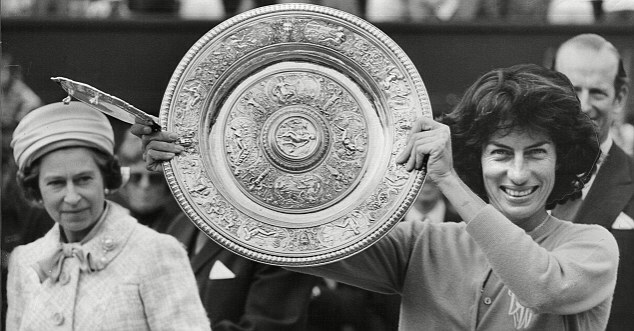 She was the first British player to win the US women’s title since Betty Nuthall in 1930. The cheque for $6,000 mattered far less than the consistent splendour of Wade’s tennis in winning it. In a tent by the Forest Hills clubhouse she attentively poured champagne for the small contingent of Brits. In those days, there were not many of us around. I recall the stray thought that Wade – like Fred Perry before her – had a character in harmony with the bustling aggression of New York. A different source of satisfaction came in the 1971 Italian championships, at that time the toughest clay-court test outside Paris. Wade liked Rome. She liked the tournament. But slow clay was not her scene. She had never mastered it: because patient, devious manoeuvring was not in her nature. That year, the field of 16 was mostly modest. But in the final Wade beat Helga Masthoff (formerly Niessen), who had once committed herself to the opinion that there was no way Wade could ever beat her on clay. Masthoff, tall and unhurried, wth more than a hint of hauteur, exuded the airs and graces of a rather supercilious grande dame. Off court, she had a droll sense of humour. On court, her iron-clad composure (plus the sharpest of tactical wits) could make the likes of Wade seem emotionally dishevelled. Beating her in Rome meant a lot to Wade. But as she poured champagne again, this time on the sunny terrace of the Foro Italico, Wade merely osbserved ‘I’ve learned how to play on this stuff’. In 1972 Wade beat Evonne Goolagong, the French and Wimbledon champion, in the Australian final. But we had to wait more than five years for the ‘phase two’ Wade to win Wimbledon. She had been playing there since she was 16 (altogether, she contested the singles for 24 consecutive years). The semi-final pairings suggested that Sue Barker was more likely than Wade to win the title for Britain. 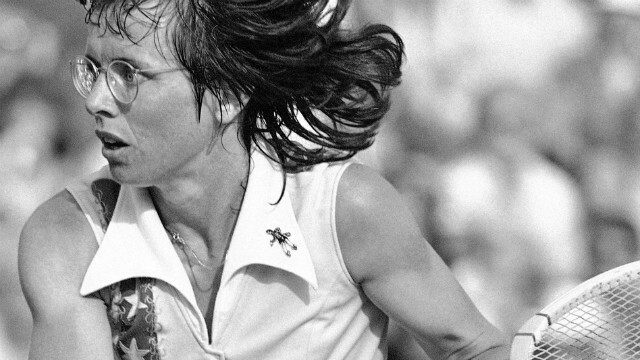 But Betty Stove beat Barker: and Wade eventually overwhelmed Chris Evert, a result that left Evert in shock for days. Then Wade beat Stove – whereupon the centre court became a raging sea of Union Jacks, applauding hands, echoing roars, repeated hurrahs, and the improvised paradox of ‘For she’s a jolly good fellow’. It was rather like the last night of the Proms: one of those special occasions on which the British let their hair down. Everything had coincided to make this a great day: anniversaries for Wimbledon and the Queen and, most of all, the long-deferred triumph of a player closely identified with tradition, royalty and patriotism. Wade was 5ft 7in tall and her weight usually hovered around 9st 7lb. She was dark and lithe, springy and athletic, thoufh rather heavy-footed. Her blue eyes had icy, alarming clarity. She had a graceful yet restlessly untamed air about her. One sensed the threatening reserves of nervous and physical energy, the jungle instinct, the prefeence (on court) for action rather than cerebral indulgences. In most of this she had much in common (and was aware of it) with the big cats. It was easy to imagine Wade in the latter role, bounding on to her prey and tearing it to bits. That natural athleticism, aggression and fighting spirit was the main reason for her success. Her racket-work was not exceptional. She had a superb first service, delivered with a classically fluent action, and her volleys were boldly terminal when she took care with them. The forehand was dangerous but often wayward, the backhand more consistently damaging – she put so much ‘work’ on the approach shot that, once over the net, it became almost subterranean. Wade was a mass of contradictory qualities, not least the fact that she seemed to be thorougly English in spite of her South African upbringing and a disposition that was probably more suited to New York (where she was to settle) than the Home Counties. She aroused conflicting emotions but nobody could feel dispassionate in the presence of so much passion. In her autobiography Wade pointed out that she had the same birthday as Arthur Ashe (two years older) and that they were the first US Open champions and both won Wimbledon at the age of 31. Add the big services, the cultural interests and the African connections, and you can begin to believe in the influence of the stars.